Initially I planned to make a viz about cheese or wine (pardon me, I'm French! ), but I realized that burgers would make for a universal food conversation. I took an economy angle to this topic by retrieving the data from The Economist's famous Big Mac index. 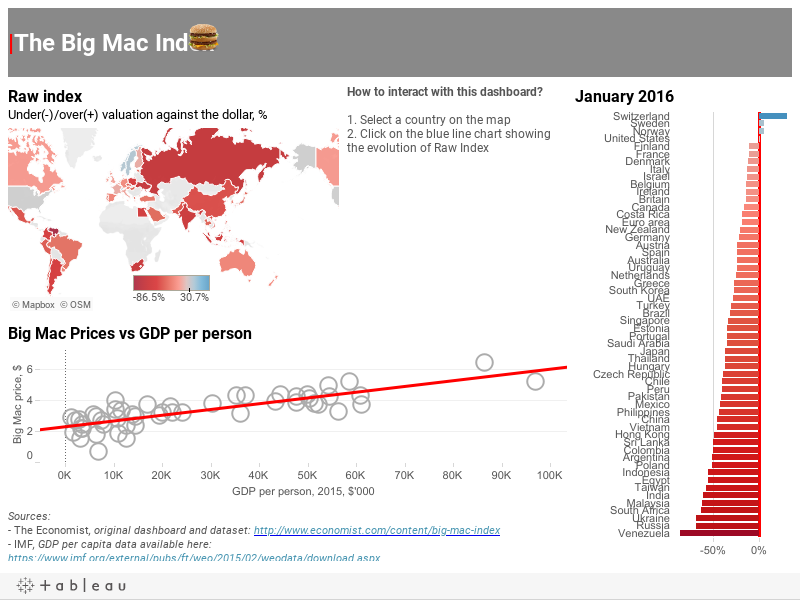 Below is my take at reproducing The Economist's Big Mac index dashboard, with some filtering action tips for those of you who are still not completely comfortable with that. Before I share with you three tips to make your life (and dashboard designing) easier, here is a quick reminder on what dashboard actions are and what they do. And now, the three tips. If you're scratching your head, wondering why your filter action doesn't work, a quick debug action is to check whether your source and target sheets share the same dimensions. For instance, trying to filter a bar chart (target sheet) by selecting a country on a map (source sheet) will not work if the bar chart doesn't contain the country dimension in the Marks, Columns, or Rows shelves. A simple diagram of which source sheet(s) should interact with which target sheet(s) can go a long way in helping you save time and energy. if you're having a lot of dashboard action going on, go with pen and paper, and map all your sheets (big squares) and actions (arrows). Do not start implementing before you have the big picture. If despite step #2, you're still having trouble making your actions work, it will be much easier to debug your dashboard if you have given clear names to each of your actions. I did spend some time trouble shooting actions in my Big Mac index viz and you'll see below that I ended up giving very explicit names to each action to help myself. Now, go forth and use these actions to reduce clutter on your own dashboards! The first tip as stated is incorrect. The TARGET sheet does not have to have the filtering dimension on the sheet, but rather the SOURCE sheet MUST have the filtering dimension on the sheet.